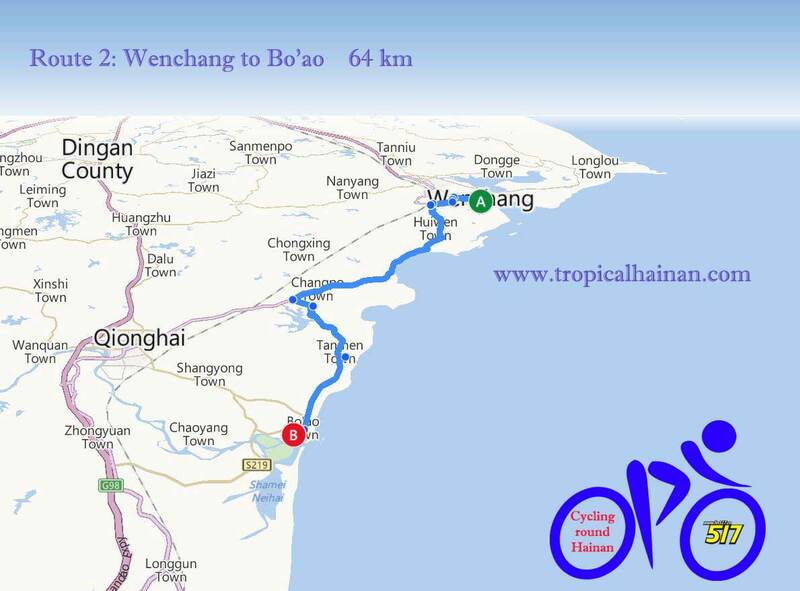 These cycling routes have been developed by Hou Shuyuan, and Chen Qicheng and translated into English by tropicalhainan.com. 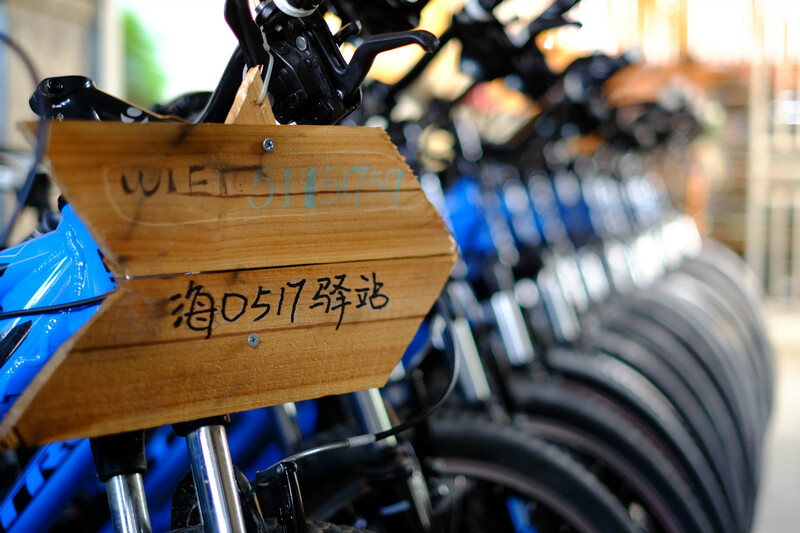 Following that there's a general introduction for everything you need to know for a safe and enjoyable cycling holiday in Hainan. January 2013, Hou Shuyuan, 27, went for a cycling trip in Hainan province to celebrate being enrolled as a postgraduate student in advertising at Chongqing Technology and Business University. During the trip, she met her future husband, Chen Qicheng, 31, from Wanning, Hainan province, and also spotted a business opportunity. Hou decided to remain in Hainan, "For love", she said with a smile. I decided to settle down here because of my boyfriend. The two started work on their business venture. 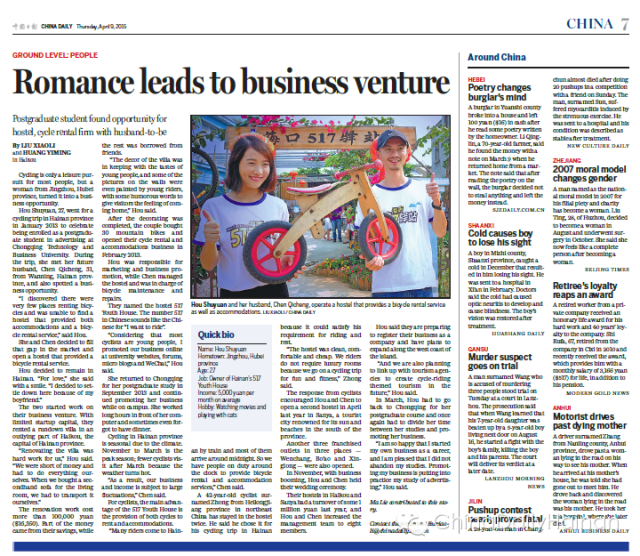 With limited startup capital, they rented a rundown villa in an outlying part of Haikou, the capital of Hainan province. 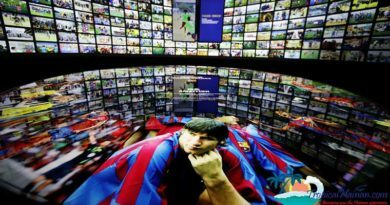 The renovation work cost more than 100,000 yuan ($16,350). Part of the money came from their savings, while the rest was borrowed from friends. After the decorating was completed, the couple bought 30 mountain bikes and opened their cycle rental and accommodations business in February 2013. 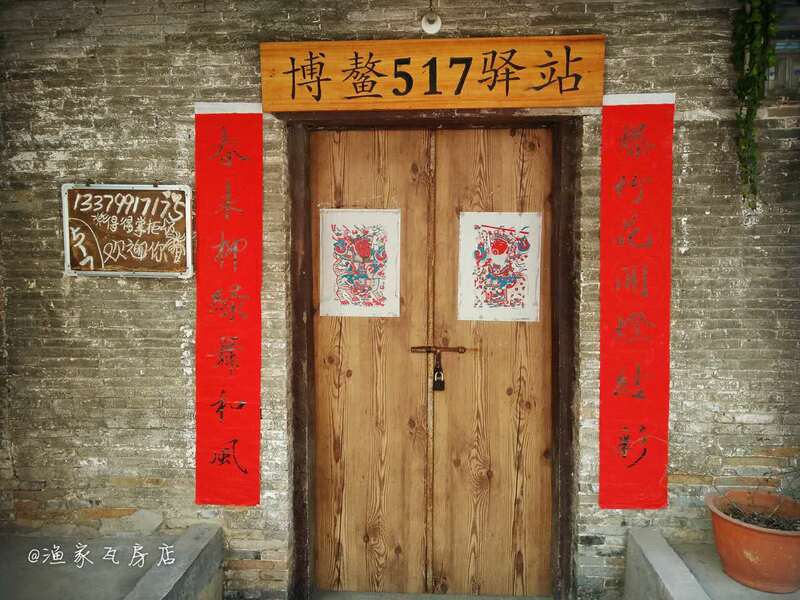 Haikou station 517 youth hostel consists two villas with a total of 70 beds, dorm style and single and twin rooms. 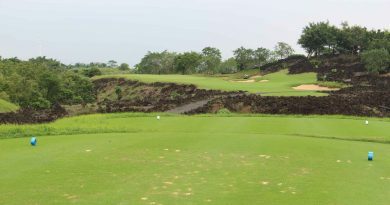 There’s a spacious and comfortable outdoor area with entertainment facilities. Their stated aim is to "provide a comfortable, warm home to cycling enthusiasts from all over the world" and it's the first station on the cycling route around the island. Address: Xiyuan villa, Xinbu island, Haikou city (Baidu map search for Haikou station 517 youth hostel) blue dot on the map. 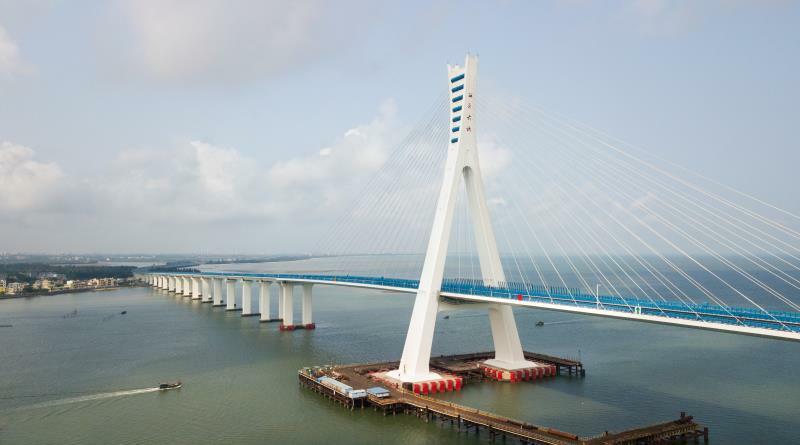 Click HERE to discover some of the attractions and things to do while in Haikou. Important Note: Not all staff speak English, (and some of the English speaking staff only work part time) make sure you get the telephone number of someone who can speak English before you set out. 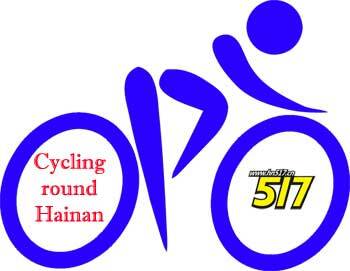 Hainan Station 517 provide emergency assistance to cyclists but it goes without saying, plan and prepare well before setting out! 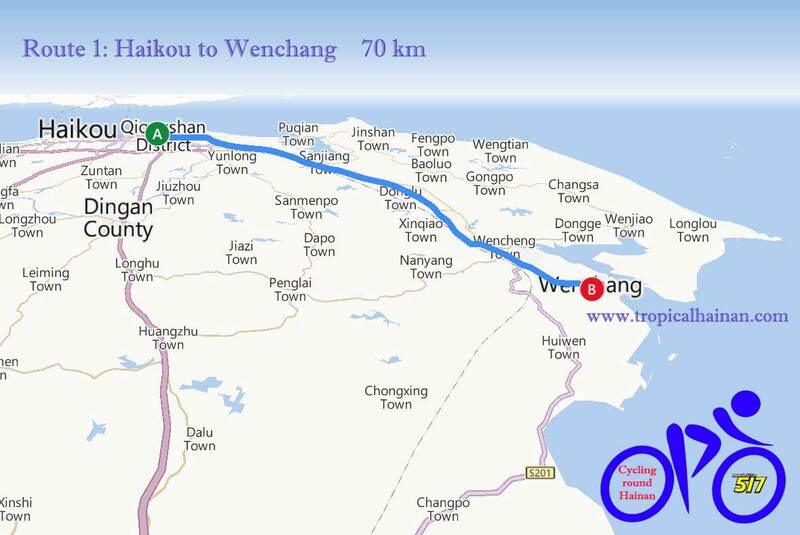 Wenchang station 517 youth hostel is located in Wenchang coconut grove at the end of the peninsula, opposite Qinglan harbor and mangrove reserve, (get the ferry from No. 1 on the map). 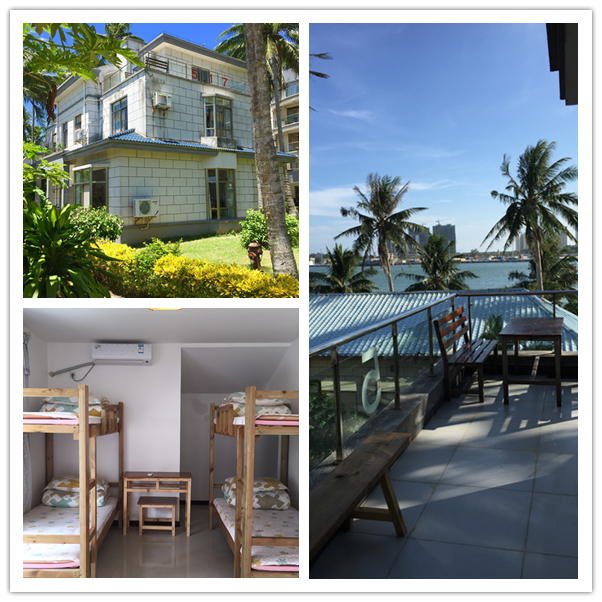 It's a cottage style hostel by the sea and very quiet. There's a wooden pontoon out into the sea, and at night it's a good spot to drink a beer, relax with the cool sea breezes and watch the stars. If you like seafood, there are many good local restaurants within walking distance. The station provide guests with: accommodation, bicycle repairs and simple maintenance, local beers, route information & information on local attractions. They also have kayak rental, and can arrange chartered boats etc. Sea view family suite 268 yuan. Ferry: Go to Qinglan harbour & the ferry station, The ferry costs 5 yuan/person, 2 yuan for bicycles. Get a genuine traditional local experience by staying at their (slightly) renovated traditional fisherman's cottage. Not for you? no worries they have a more modern hostel just 200 metres down the road. Bo’ao Station 517 youth hostel is in the paradise town of Boao, Qionghai, a minute’s walk from the beach (also famous for the Bo'ao Asia Forum). There are two hostels available, the older one is a converted fisher man’s house constructed from old style gray bricks and tiles and retains its old style atmosphere. The newer one has a literature theme and the hostels are about 200 meters apart. What makes Bo’ao Station 517 special is both of the owners are travel enthusiasts. Shensheng is a serious cyclist, he has biked all around east, central and south China. In 2015 he cycled from Xinjiang to Tibet. Reproduced with permission from the Hainan Tourism Centre.